They say the eyes are the mirror of your soul and your beautiful outward reflection, shadow play an important role. It ranges from larger, smaller, wider or close-set eyes. Pick the perfect eye shadow application for your eyes. The first of each base to apply your eye to give a smooth surface, as it prevents wrinkles eyeshadow and make it last longer. 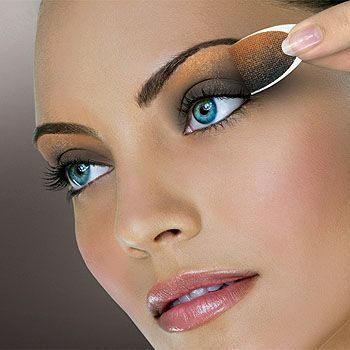 Once the base is on the eyelid, select your color and first of all apply to the lighter color. Be applied in the form of medium and look deeper than the darkest shade to make your eyes big and beautiful. Eyecup Perfect for small eyes in bright colors with dark color in apparent size. Bring the shadows a bit in the outer corners of your eyes. Similarly, if you have a sunken eyes they give prominent application of light or medium eye shadow from the inner corner of your eye to the outer. For smoky eyes, the perfect eye shadow begins in neutral colors. Start lining both top and bottom lids with black eyeliner. Mark carefully the liner in the outer corners and apply eyeshadow over your eyeliner to soften the look. To finish the smoky eye makeup, apply eyeshadow over your eyelid and apply mascara. For wide-set eyes, one should focus on inner corners using eye shadow in the inner regions, use dark eye shadow on the inner corner of eye shadow and lighter on the outer sides. For brown eyes, select the light tones of brown and hazel based on your skin and it will be a huge difference in your appearance and can really highlight your brown eyes to make. For a perfect eye makeup for green eyes, in the first place you see eye color. Different eye shades of brown, deep purple, plum, lilac and dark green are great choices for green eyes. You can also choose from three colors in the same color. Apply the lightest color on the eyebrows, the medium shade on the lid and the deepest color in the crease. For blue eyes, it is better to tones that contrast with your natural eye color to choose.